For centuries, the male gaze has dominated the history of art and of artists. The active, heroic male artist studies and paints the passive, beautiful female model. Even today, our movies, television shows, and advertising favor the heterosexual male perspective by offering up the female form as an alluring and sexualized object. Here, we seek to examine an alternative question: What does it look like when women artists depict women? View the exhibition checklist for The Power of the Female Gaze. Thursday, June 22, 2017 | A Curator’s Talk with Jessica Marten and Ortensia de Loren. New York State granted women voting rights in 1917, making this year the centennial of that historic decision. To celebrate, the Susan B. Anthony Center, along with local and state organizations, will be hosting events throughout the year to mark this important anniversary. 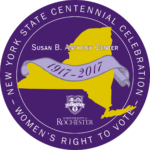 Presented in celebration of the 100th anniversary of women’s suffrage in New York State and in honor of MAG’s Gallery Council and Docents.